The ideal solution for almost any repair, Gorilla Clear Repair features the strength of Gorilla Tape in a weatherproof, airtight, crystal clear tape. Fix, patch, seal, hold and protect almost any surface with a crystal clear appearance for a perfect fix every time. Duck Black & Yellow Stripes Printed Duct Tape, 1.88 inch x 15 yds. Available in a trendy assortment of patterns and designs, Black & Yellow Stripes Duck Tape Brand Duct Tape is the simple solution for your toughest and most creative craft or DIY projects. Use Duck Tape prints to enhance your latest fix around the house, decorate and customize your space or even make a colourful wallet or rose. Offering the same trusted quality and durability as the original Duck Brand Duct Tape, it's the perfect medium for repair, crafting, decorating and fashion projects. Duck Carbon fibre Printed Duct Tape, 1.88 inch x 10 yds. Available in a trendy assortment of patterns and designs, Carbon fibre Duck Tape Brand Duct Tape is the simple solution for your toughest and most creative craft or DIY projects. Use Duck Tape prints to enhance your latest fix around the house, decorate and customize your space or even make a colourful wallet or rose. Offering the same trusted quality and durability as the original Duck Brand Duct Tape, it's the perfect medium for repair, crafting, decorating and fashion projects. Get crisp, clean lines on your next painting project with FrogTape Multi-Surface Painter's Tape. How does it work? It's made with exclusive PaintBlock Technology, a super-absorbent polymer that reacts with the water in latex paint and instantly gels to form a micro-barrier that seals the edges of the tape to prevent paint bleed. The result is a crisp, professional paint line. Designed to work on a variety of surfaces, this professional grade painter's tape delivers a performance you can be proud of. Gorilla Clear Repair Tape The ideal solution for almost any repair, Gorilla Clear Repair features the strength of Gorilla Tape in a weatherproof, airtight, crystal clear tape. Fix, patch, seal, hold and protect almost any surface with a crystal clear appearance for a perfect fix every time. 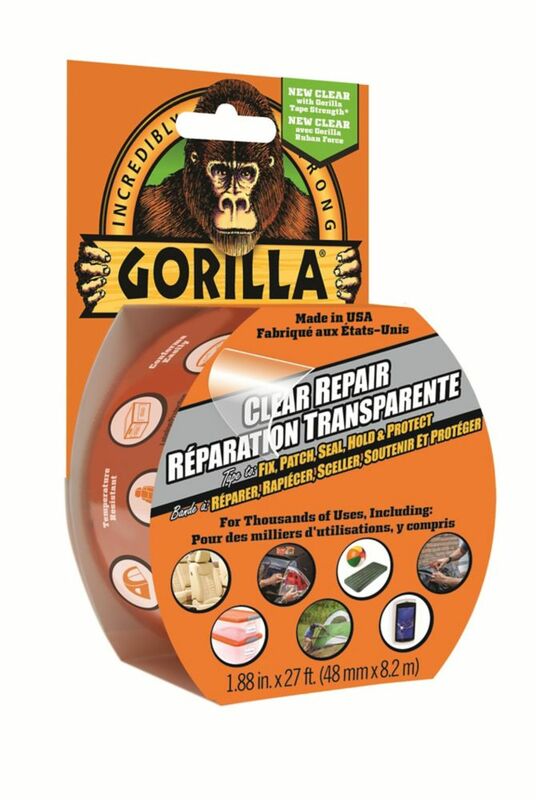 Gorilla Clear Repair Tape is rated 3.3 out of 5 by 3. Rated 4 out of 5 by Jeannie from Covered an art project I bought this today, having also reviewed two brands of transparent duct tape, to cover an art project that had been applied to a plastic file folder. The tape is adhering well to the art (a collage on a painted background) on one side, and to the plastic back side as well. It is very clear, stronger than packing tape, and you can tear it with your hands. You have to be careful about fingerprints though. Rated 5 out of 5 by Homedepot client from Better than I expected Used the tape to patch a crack on my van. Really steady works well even under snowy and salty condition! Rated 1 out of 5 by nicknamekathy from DO NOT BUY This product does not do what it says. It would not hold a very light item to my wall. Can this be used for small vinyl siding repairs ?